Who Was E.M. Smith and EMSCO? E. M. Smith was a Pennsylvanian, born in Pittsburg (as it was then spelled) in 1881. He came west for clean air and room enough for his great ambition. A family fortune derived from an oil-well drill-bit patent allowed him to pursue several ventures before he formed the first of his EMSCO companies in 1911 to manufacture transmission belting, rubber products, and brake linings. The latter line developed into a separate business, EMSCO Asbestos. And then the EMSCO's multiplied like rabbits: There were soon the EMSCO Refractories Company, the EMSCO Derrick and Equipment Company, the EMSCO Aero Engine Company, and the EMSCO Aircraft Corporation. It was his aviation-related units that seemed to capture Smith's interest the most. In the late '20s he bought a 73-acre ranch in Downey (below) and built an airport with two runways and an assembly plant to manufacture a full line of land and amphibious aircraft. Special orders included eight bombers for the Mexican government (bombers for Mexico?) and a stunt plane for a Romanian prince. EMSCO Aircraft was well capitalized and able to attract some of the best talent in the industry, including Gerald Vultee, whose initial would later become the "V" in Convair (the contraction of "Consolidated-Vultee Aircraft"). Above- Rancher James Hughan sold his ranch to E.M. Smith in 1929. Smith built EMSCO Aircraft Corporation and an aircraft runway. Emsco Aircraft Corporation brochure page from 1929. Below- The EMSCO plant in Downey, California at 12214 Lakewood Blvd. Shown here in a Security National Aircraft brochure from 1932. Above- The EMSCO plant in Downey, California at 12214 Lakewood Blvd. Shown here in a Security National Aircraft brochure 1932. In addition to manufacturing aircraft, Smith saw the former farm land in Downey as a perfect landing field. The oldest buildings on the Downey Site were built in 1929 to support the aircraft manufacturing effort. 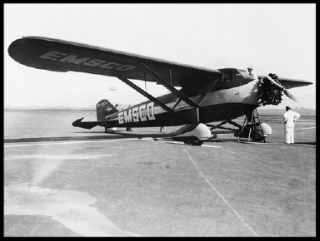 In 1932, with the Great Depression lagging and poor sales, EMSCO leased the site to Champion Aircraft Corporation who manufactured small, inexpensive 2 seaters meant to fly at low altitudes and low (as little as 10 mph) speeds. Seven months later, Champion also left the site due to poor sales, and the site was leased to Security National Aircraft Corporation. 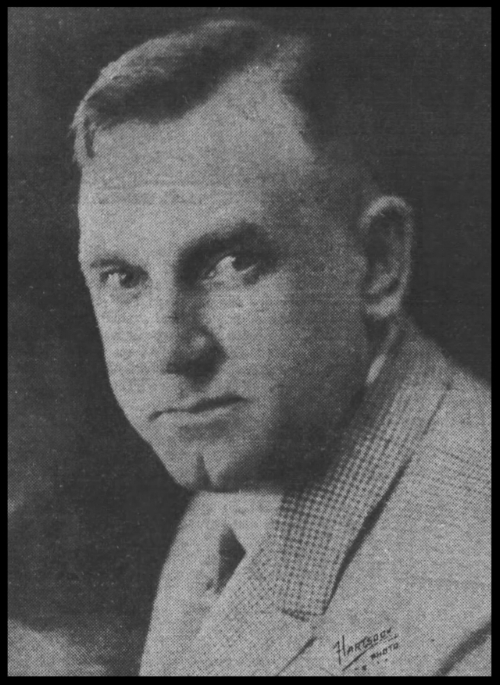 Security was owned by Walter "Bert" Kinner, who designed and built 2 planes for Amelia Earhart. The Depression, however, slowed orders to the point that it became more profitable for Smith to lease his facilities to other firms. It wasn't as though E. M. didn't have other businesses to attend to, however—not only were there the other EMSCOs, there were now the D&B Pump and Supply Company, the Peerless Pump Company, the National Tools and Metals Company, and his presidency of the Pacific National Bank. Even pushing 40, E. M. would probably have been content to work hard and play the field—but then he met a wily woman with a big bear trap, the woman behind 33 Berkeley Square." More on E.M. Smith's fascinating life. Source- "33 Berkeley Square"
Below- The EMSCO Aircraft Building as it looked in early 1930's. Above- Front of the original EMSCO office/plant in Downey, CA. Originally Cerritos Avenue, the street would change to Lakewood Blvd. A portion of this building still stands today at 12214 Lakewood Blvd. The Los Angeles Times Sun Jun 23,1929. "Emsco begins production." "EMSCO Aircraft was a short-lived division of the E.M. Smith Company (best-known for producing equipment for the oil industry). 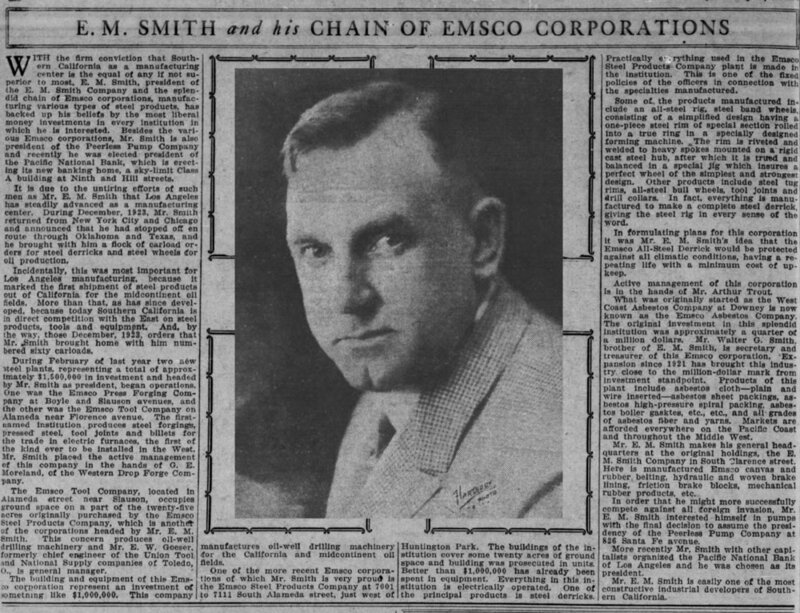 In 1928, Smith's company bought the Zenith Aircraft Corporation of Long Beach, California, and transformed it into the EMSCO Aircraft Corporation. Zenith had been formed to develop a range of highly efficient transport aircraft (all powered by Ryan/Siemens-Halske radial engines). These transports were to be made in 3-, 6-, and 12-seat models. The Los Angeles Times Sun, Nov. 10, 1929 EMSCO plant opens in Downey, CA. "At some point prior to January 1930, the EMSCO Aero Engine Co. was also established to pursue diesel engine development under the former head of NACA's Langley Aeronautical Laboratory, Leigh M. Griffith. EMSCO continued to develop aircraft designs until 1931 but was considered a 'hard luck' firm. As with many aviation companies, the Great Depression put paid to EMSCO Aircraft Corporation. Some of the design rights stayed with Rocheville (who continued to develop his Arctic Tern amphibian design into 1933). The EMSCO facility at Downey was leased first in 1931 to Champion Aircraft Corporation of America, in 1933 to Security National Aircraft Corporation (Walter (Bert) Kinner's attempt at aircraft production), before Vultee returned to this site in 1936". Above- EMSCO B-8 Flying Wing. E.M. Smith on the left. 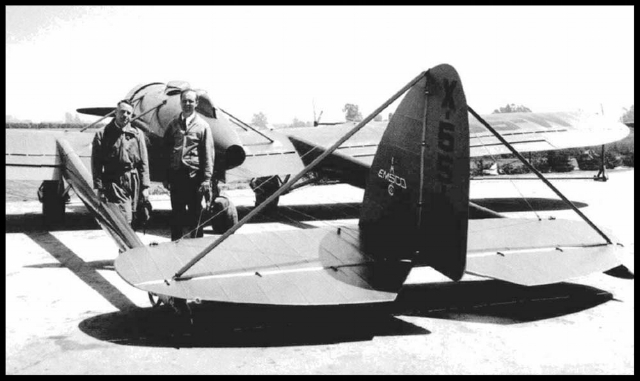 Above- Emsco Flying Wing in 1930. Above- E.M. Smith (2nd from right) meets with Downey officials, 1933. It was a warm summer morning in the early 1940s in Downey, California. The kids we played with every day: Johnny Rodriquez, Kenny and Donna Ganser, Buddy Hayman, Ray Cabrera, Mory Guarrero, Ward Dawson, my brother Mike and I were busy with a game of “work-up” softball in the middle of Davis street when a 1939 Grey Plymouth business coupe turned on to Davis from Downey Avenue. The driver saw us and promptly pulled over to the right and parked off the road next to our 9-foot tall solid fir tree fence. As he got out we all recognized him as “Uncle Ed”. He waved with a big smile on his face and dug into his right pants pocket for a handful of bright shiny $1.00 coins as we all ran over to greet him. He had a treasure coin for each of us. After a handshake, small talk and a hand tousled hair touch he was off to our house to visit with my Mom, his favorite, niece. After a visit with her he would walk across Downey Avenue to visit with Mrs. Edna Fether, she was Don’s wife and Aunt Mimmie’s daughter–in-law. A little while later he would come back to the car and wave goodbye. He was just a great guy! Uncle Ed, E.M. Smith, worked his way from Charleroi, PA., near Pittsburgh across the USA to San Francisco, arriving in the city near the end of the 19th century. He was 18-years old and found work in the various manufacturing businesses in this fastest growing city in the west. He was very skilled mechanically but found his real niche in sales. By the time of the big San Francisco Earthquake he was a top salesman for Diamond Rubber Company selling drive belts for mechanical equipment. After the quake in April 1906, he was sent by the company to Los Angeles to supply the very fast growing business community of the “southland”. He was a very personable and, with his mechanical ability, a very helpful supplier of mechanical drive belts and equipment. He really got to know, not only the movers and shakers, but also what their future needs would be. By 1911, with the help of his father, my great grandfather, Henry John Smith, and his brothers, Walter and Joseph, (He had sent for all of them from the Pittsburg area as he became more and more established and successful.) he established the E. M. Smith Co.
His first major line of products revolved around reinforced rubber belts and belt drive mechanical equipment. He was not afraid to partner with others and expand his product line to meet the needs of a growing Los Angeles. The oil industry was in its infancy as were the auto and truck industries, engines, transmissions, brakes, oil towers, modern concrete construction, and even the banking industry, each needed aggressive and competent leadership and Uncle Ed knew and was a part of that leadership. By 1924, his ownership included: The E.M. Smith Co., West Coast Asbestos and Brake Lining Co., Emsco Derrick and Equipment Co., Western Forge Co., Peerless Pump Co., Los Angeles Pump Supply Co., Emsco Piston and Brake Co. and Pacific National Bank of Los Angeles. In 1928, with the massive construction going on in downtown LA, Emsco Concrete Cutting Co. was formed to provide services to demolish and dispose of old buildings and roadway surfaces and to prepare sites for new construction. Uncle Ed never let a dream slip by. In 1928, he put together a team to design and construct private aircraft. They were to be used for sport, business and commercial aircraft travel. In 1929, he had established and built EMSCO Aircraft in Downey which one day would become the “Home of Apollo” and the Space Shuttle. During WWII, Uncle Ed’s companies were devoted to the war effort and after the war he established Globe Oil Tool Co. and designed and built the first mobile starting gate for harness races. As we grew up we knew Uncle Ed was rich, but he was a friendly uncle that shared time with us and had encouraging words and smiled as he told us stories. We visited his office at work and his homes. We even went to his Arizona ranch to watch the cowboys roundup his cattle and brand the new little calves with his Bar-Heart brand. I remember a number of trips to his Lido Isle home in Newport Beach and swimming in the bay at the beach club, and him taking us for a ride in his rowboat that he rowed. He and Aunt Mimmie (Marian Fether Smith) were married in 1919, they built a big house in Berkeley Square west of downtown Los Angeles in 1923. They were out of that house in the early 1940s selling it to a doctor. I was never in that house, and Caltrans condemned it under eminent domain proceedings in the 1960s for the Santa Monica freeway. I would visit their Downey hide-away home that was next door to us on Downey Avenue. When Uncle Ed and Aunt Mimmie wanted to get away for some quiet time they would come with their maid, Maddy, for a few days. Maddy made cookies for us and would call us over to get them. Aunt Mimmie had two matching big Dalmatians who were very quiet and not too scary even for 5 and 7 year-olds. Aunt Mimmie just left the scene in 1940, the next thing we kids knew Uncle was married to a very nice Aunt Catherine. They had a beautiful home in the hills just above downtown Whittier. We would visit that home and the new home they built on Lido Isle. Uncle Ed moved his office from South Alameda St. in Los Angeles to Globe Oil Tools off Los Nietos Rd. in Santa Fe Springs, CA. to be closer to home. Aunt Catherine died in a terrible auto accident in Whittier in 1948. Uncle Ed was heartbroken and never really recovered. He did build a church hall in her honor at St Mary’s Catholic Church in Whittier. It was dedicated on the day of his death, March 17, 1950. He died of natural causes, a broken heart, at the age of 69. Above- EMSCO Oil Derrick Company. Image- Downey Historical Society. Stonewood Shopping Center in Downey. The Los Angeles Times Sun. Dec. 1, 1957. E.Morris Smith is E.M. Smith, the man who built Emsco Aircraft in Downey. Above- E.M. and Catherine on the dock at 501 Via Lido Soud house, now owned by Ramona Smith, wife of E.M.'s nephew "Morrie" Smith. Above- E.M. Smith and wife Catherine. 1940's.